Here is the camera and stand setup. The stand is a 80cm lab stand. I bought 2 of these with various clamps and supports. Another Taobao special. Below is the first prototype board. It is working and allows for up to 9 drops but still has many things that need doing. 2 solenoids can be connected although only one can be controlled through the software at present. Only the shutter release is connected. No focus control. At present I am controlling the shutter release not the flashes. A more common way of photographing high speed events is to use bulb mode in a dark room and trigger the flashes. I plan to add flash triggers which will then allow me to use either a camera trigger or a flash trigger. 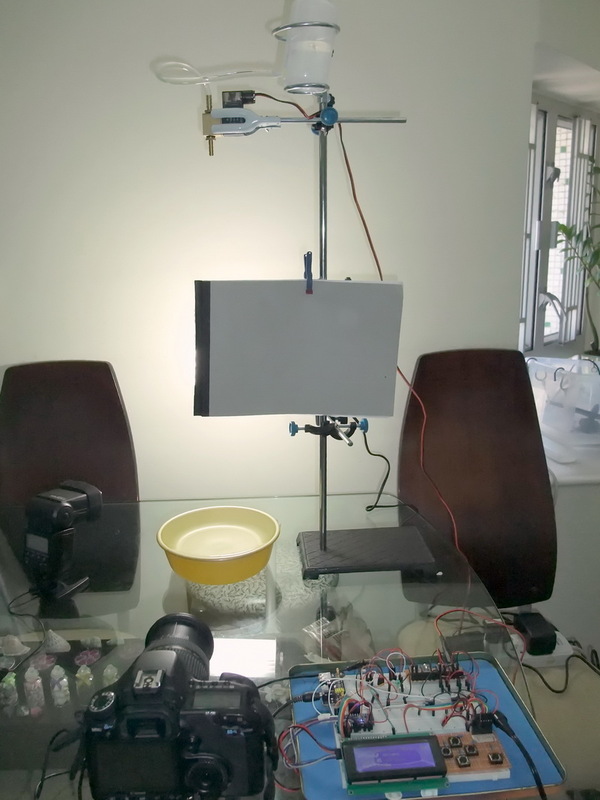 At present the camera and the solenoids are controlled by the same Arduino. I have decided to separate these functions and create a separate Drop Controller and a separate Camera Controller. Congrats on the work.. Love the canon gear, that is me too.